In honor of Russell Means who passed away last Tuesday. Also check out this remembrance by Tom Hayden in The Nation. In a provocative piece, the American Indian Movement activist lashed out at European "death culture" and the left. Russell Means Lionel Delevingne / Picture GroupEditor's note: This article originated as a controversial speech given at the Black Hills International Survival Gathering on the Pine Ridge Reservation in July 1980. 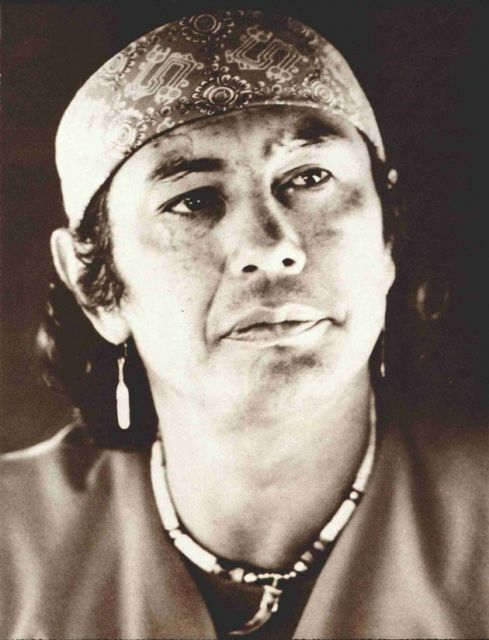 A member of the Oglala Lakota tribe, Russell Means was perhaps the most outsized personality in the American Indian Movement, beginning with the 1973 occupation of Wounded Knee. He also had an acting career beginning with his role as Chingachgook in Last of the Mohicans . He died Monday morning at age 72. The only possible opening for a statement like this is that I detest writing. The process itself epitomizes the European concept of "legitimate thinking": what is written has an importance that is denied the spoken. My culture, the Lakota culture, has an oral tradition, so I ordinarily reject writing. It is one of the white world's ways of destroying the cultures of non-European peoples, the imposing of an abstraction over the spoken relationship of a people. So what you read here is not what I've written. It's what I've said and someone else has written down. I will allow this because it seems that the only way to communicate with the white world is through the dead, dry leaves of a book. I don't really care whether my words reach whites or not. They have already demonstrated through their history that they cannot hear, cannot see; they can only read (of course, there are exceptions, but the exceptions only prove the rule). I'm more concerned with American Indian people, students and others, who have begun to be absorbed into the white world through universities and other institutions. But even then it's a marginal sort of concern. It's very possible to grow into a red face with a white mind; and if that's a person's individual choice, so be it, but I have no use for them. This is part of the process of cultural genocide being waged by Europeans against American Indian peoples today. My concern is with those American Indians who choose to resist this genocide, but who may be confused as to how to proceed. (You notice I use the term American Indian rather than Native American or Native indigenous people or Amerindian when referring to my people. There has been some controversy about such terms, and frankly, at this point, I find it absurd. Primarily it seems that American Indian is being rejected as European in origin—which is true. But all the above terms are European in origin; the only non-European way is to speak of Lakota—or, more precisely, of Oglala, Bruleě, etc.—and of the Dine, the Miccosukee, and all the rest of the several hundred correct tribal names. It takes a strong effort on the part of each American Indian not to become Europeanized. The strength for this effort can only come from the traditional ways, the traditional values that our elders retain. It must come from the hoop, the four directions, the relations; it cannot come from the pages of a book or a thousand books. No European can ever teach a Lakota to be Lakota, a Hopi to be Hopi. A master's degree in "Indian Studies" or in "education" or in anything else cannot make a person into a human being or provide knowledge into the traditional ways. It can only make you into a mental European, an outsider. I should be clear about something here, because there seems to be some confusion about it. When I speak of Europeans or mental Europeans, I'm not allowing for false distinctions. I'm not saying that on the one hand there are the by-products of a few thousand years of genocidal, reactionary, European intellectual development which is bad; and on the other hand there is some new revolutionary intellectual development which is good. I'm referring here to the so-called theories of Marxism and anarchism and "leftism" in general. I don't believe these theories can be separated from the rest of the European intellectual tradition. It's really just the same old song. The process began much earlier. Newton, for example, "revolutionized" physics and the so-called natural sciences by reducing the physical universe to a linear mathematical equation. Descartes did the same thing with culture. John Locke did it with politics, and Adam Smith did it with economics. Each one of these "thinkers" took a piece of the spirituality of human existence and converted it into a code, an abstraction. They picked up where Christianity ended; they "secularized" Christian religion, as the "scholars" like to say—and in doing so they made Europe more able and ready to act as an expansionist culture. Each of these intellectual revolutions served to abstract the European mentality even further, to remove the wonderful complexity and spirituality from the universe and replace it with a logical sequence: one, two, three, Answer! This is what has come to be termed "efficiency" in the European mind. Whatever is mechanical is perfect; whatever seems to work at the moment—that is, proves the mechanical model to be the right one—is considered correct, even when it is clearly untrue. This is why "truth" changes so fast in the European mind; the answers which result from such a process are only stop-gaps, only temporary, and must be continuously discarded in favor of new stop-gaps which support the mechanical models and keep them (the models) alive. Hegel and Marx were heirs to the thinking of Newton, Descartes, Locke, and Smith. Hegel finished the process of secularizing theology—and that is put in his own terms—he secularized the religious thinking through which Europe understood the universe. Then Marx put Hegel's philosophy in terms of "materialism," which is to say that Marx despiritualized Hegel's work altogether. Again, this is in Marx' own terms. And this is now seen as the future revolutionary potential of Europe. Europeans may see this as revolutionary, but American Indians see it simply as still more of that same old European conflict between being and gaining. The intellectual roots of a new Marxist form of European imperialism lie in Marx's—and his followers'—links to the tradition of Newton, Hegel, and the others. Being is a spiritual proposition. Gaining is a material act. Traditionally, American Indians have always attempted to be the best people they could. Part of that spiritual process was and is to give away wealth, to discard wealth in order not to gain. Material gain is an indicator of false status among traditional people, while it is "proof that the system works" to Europeans. Clearly, there are two completely opposing views at issue here, and Marxism is very far over to the other side from the American Indian view. But let's look at a major implication of this; it is not merely an intellectual debate. The European materialist tradition of despiritualizing the universe is very similar to the mental process which goes into dehumanizing another person. And who seems most expert at de humanizing other people? And why? Soldiers who have seen a lot of combat learn to do this to the enemy before going back into combat. Murderers do it before going out to commit murder. Nazi SS guards did it to concentration camp inmates. Cops do it. Corporation leaders do it to the workers they send into uranium mines and steel mills. Politicians do it to everyone in sight. And what the process has in common for each group doing the dehumanizing is that it makes it all right to kill and other wise destroy other people. One of the Christian commandments says, "Thou shalt not kill," at least not humans, so the trick is to mentally convert the victims into nonhumans. Then you can proclaim violation of your own commandment as a virtue. Read on here. Interesting article in today's Statesman. Wonder how folks will interpret this? "In today’s labor market, workers need at least a year’s worth of college plus a degree or credential valued by employers in order to reach a tipping point in their earnings." A quick reaction is that the over-riding concern of this piece is on employment and individual earnings. If we were looking at promoting the power and influence of minorities and the poor in society, that's quite a different matter. While improving access to good-paying jobs is a must, this intervention is not sufficient for a more equitable redistribution of status, privilege and power in society. I do appreciate though the two-generation approach. Increasing mothers' skills and earnings while their children are young is a very positive thing. To this end, our cities, districts, and universities should, in my view, partner in and with these efforts to promote adult education. Indeed, we should partner with Mexico to develop binational projects and programs that could accomplish this for our Spanish-dominant populations. This study by the Center for American Progress spells out exactly what has happened in the U.S. with the withering away of workers' bargaining rights. They found that legal and political environments the the context of the private sector block workers from freely expressing their rights. Hence, representation of unions in this sector today stands at >7% compared to around 30% in the 1960s. This report further finds that the income of the top 1% of Americans more than doubled between 1974 and 2007. For the top .1%, their earnings quadrupled over this time period. They conclude that a 10% boost in unionization would raise Americans' average annual incomes by $1,051 per year. Ohio is a political bright spot in this regard. Voters overturned a Republican-crafted law that eliminated public workers' collective bargaining rights. Wisconsin is another bright spot. A judge struck down most of this legislation that practically ended collective bargaining rights. President Obama supports bargaining rights for workers. In contract, Romney supports a national right-to-work law that will restrict bargaining rights. If we are to forestall the further "pauperization" of our city and schools (to use Jean Anyon's words), the choice for the presidency is clear. Unions give workers a greater voice not only by promoting political participation among all Americans—ensuring that more of the middle class vote and get involved in politics—but also by being an advocate on behalf of the middle class in the daily, inner-workings of government and politics. Why should anyone—especially those who are not union members—care that union membership is at record lows and likely to fall even further? Because if you care about the middle class, you need to care about unions. Critics of unions claim they are unimportant today or even harmful to the economy, but unions are essential for building a strong middle class. And rebuilding the middle class after decades of decline and stagnation is essential for restoring our economy. Unions make the middle class strong by ensuring workers have a strong voice in both the market and in our democracy. When unions are strong they are able to ensure that workers are paid fair wages, receive the training they need to advance to the middle class, and are considered in corporate decision-making processes. Unions also promote political participation among all Americans, and help workers secure government policies that support the middle class, such as Social Security, family leave, and the minimum wage. But as unions became weaker over the past four decades, they are less and less able to perform these functions—and the middle class withered. The percentage of workers in unions steadily declined largely because the legal and political environment prevents private-sector workers from freely exercising their right to join or not to join a union. Membership in private-sector unions stands at less than 7 percent today, from around 30 percent in the late 1960s. Public-sector unionization remained stable for decades—it was 37 percent in 1979 and is 36 percent today—but is now under significant threat from conservative political opposition and could start declining as well. All told, less than 12 percent of the total workforce is unionized, and this percentage is likely to continue falling. Without the counterbalance of workers united together in unions, the middle class withers because the economy and politics tend to be dominated by the rich and powerful, which in turn leads to an even greater flow of money in our economy to the top of income scale. As can be seen in Figure 1, the percentage of unionized workers tracks very closely with the share of the nation’s income going to the middle class—those in the middle three-fifths of income earners. In recent years, the middle class accounted for the smallest share of the nation’s income ever since the end of World War II, when this data was first collected. The middle three income quintiles, representing 60 percent of all Americans, received only 46 percent of the nation’s income in 2009, the most recent year data is available, down from highs of around 53 percent in 1969. The middle class weakened over the past several decades because the rich secured the lion’s share of the economy’s gains. The share of pretax income earned by the richest 1 percent of Americans more than doubled between 1974 and 2007, climbing to 18 percent from 8 percent. And for the richest of the rich—the top 0.1 percent—the gains have been even more astronomical—quadrupling over this period, rising to 12.3 percent of all income from 2.7 percent. In contrast, incomes for most Americans have been nearly flat over this same time period, and median income after accounting for inflation actually fell for working-age households during the supposedly good economy in the recovery between 2001 and 2007. The importance of unions to the middle class is not just a historical phenomenon, but is relevant to our lives today. To be sure, not everything unions do benefits the broad middle class, but unions are critical to defending the middle class, and their resurgence is key to rebuilding the middle class. Indeed, it is hard to imagine a middle-class society without a strong union movement. Across the globe, the countries with the strongest middle classes all have strong union movements. And in America today, states with higher concentrations of union members have a much stronger middle class. The 10 states with the lowest percentage of workers in unions all have a relatively weak middle class, with the share of total state income going to households in the middle three-fifths of income earners in these states below the average for all states. Our analysis, more fully described in the body and appendix of this report, indicates that each percentage point increase in union membership puts about $153 more per year into the pockets of the middle class—meaning that if unionization rates increased by 10 percentage points (about the level they were in 1980)—then the typical middle class household would earn $1,532 more this year. This figure indicates how much better off all members of the middle class would be—not just those who are union members— if unions regained some strength. And these gains would continue year after year. To put these results in context, our analysis indicates that increasing union membership is as important to rebuilding the middle class as boosting college graduation rates, results that while shocking to some, are consistent with previous research. In our democracy, when workers are joined together in unions they are able to more forcefully and effectively speak for their interests. Unions give workers a greater voice not only by promoting political participation among all Americans—ensuring that more of the middle class vote and get involved in politics—but also by being an advocate on behalf of the middle class in the daily, inner-workings of government and politics. This provides a check on other powerful political interests, such as corporations and the very wealthy, and ensures that our system of government has the balance of interests that James Madison, a chief framer of our constitution, thought necessary to properly function. This counterbalancing role is essential for democracy to function properly and respond to the interests of all Americans. In the workplace, workers who join together in unions are able to negotiate on more equal footing with their employers, providing a check on the inherently unequal relationship between employer and employee. As George Shultz, secretary of labor during the Nixon administration and secretary of state during the Reagan administration argued in support of trade unions, in “a healthy workplace, it is very important that there be some system of checks and balances." And government employers, like corporations, sometimes need to be reminded by organized workers to treat their employees fairly. That’s why Dr. Martin Luther King Jr. traveled to Memphis in 1968 to help city sanitation workers gain recognition for their union as they faced low pay, terrible working conditions, and racist supervisors. Even the conservative icon Ronald Reagan recognized that publicsector workers should be able to join unions and collectively bargain. Reagan signed a bill to grant municipal and county employees the right to do so when he was governor of California. Critically, the benefits of workers having a voice in the economy and in democracy spill over to all of society. In these ways, unions make the middle class. The challenge of rebuilding the middle class will take a long time, but would be impossible without a clear understanding of what makes the middle class strong. This paper will explore in detail why we need to do this and how we need to go about it. To rebuild America’s middle class, we need to rebuild the labor movement. It’s that simple—and that challenging. David Madland is the Director of the American Worker Project, Karla Walter is a Senior Policy Analyst, and Nick Bunker is a Special Assistant with the Economic Policy team at the Center for American Progress. Education Profiteering: Wall Street's Next Big Thing?